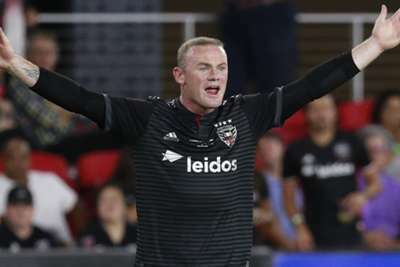 Wayne Rooney continued his fine scoring form in MLS as his brace inspired a 3-1 win against New York City to confirm DC United's place in the play-offs. DC were struggling at the wrong end of the Eastern Conference when Rooney arrived from Everton ahead of the club's Audi Field opening, but a sensational run has seen the four-time MLS Cup champions seal a post-season berth. Rooney has scored 12 goals in 19 MLS games, prompting talk of an unlikely bid for the league's MVP award, and he was influential again on Sunday. The former Manchester United and England captain opened the scoring early on and was then involved in the build-up to Luciano Acosta's strike, securing a 2-0 lead at the break. DC were dominant and netted again through Rooney from the penalty spot after a handball in the area, although the veteran star gave the ball away cheaply for a late David Villa consolation goal. Ben Olsen's men climb to fifth place in the East, above the Columbus Crew and level on points with the Philadelphia Union, with one game remaining in the regular season.